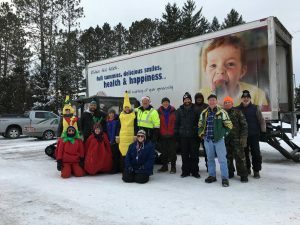 The partnership between Iron County UW-Extension, Iron County Human Services, community volunteers and Second Harvest Northern Lakes Food Bank make the Iron County Mobile Food Pantry a very successful program. Together, they address the needs of Iron County residents and work towards building a community where healthy, nutritious foods are available to everyone, even when times are tough. Mobile Food Pantry partners take pride in their work and are there, rain, shine or snow on the last Monday of the month, from 12:00-1:00 pm. Pick up is simple. Participants receive their food as they drive through the Iron County Recycling Center parking lot in Hurley, without ever having to leave their vehicle. Registrations are accepted throughout the year, with an annual re-registration taking place every August to be sure all records are up to date. Upon registration, participants complete the Mobile Food Pantry Eligibility Form and must provide a photo ID and second proof of residency. It only takes a few minutes! 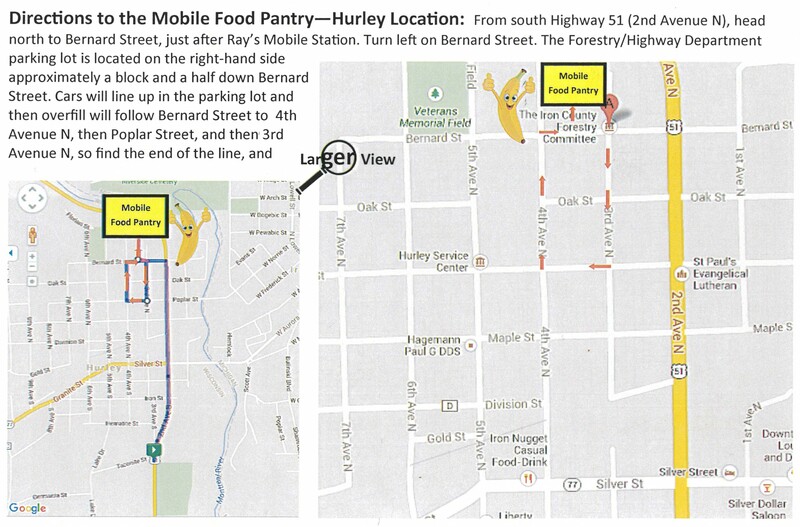 Please contact Rebecca Holm at 715-561-2695 or rebecca.holm@ces.uwex.edu if you would like to learn more about the Iron County Mobile Food Pantry, would like to volunteer or if you know someone that would be interested in the program. The Iron County Food Pantry is open on Mondays from 9:00 am to 4:00 pm and on the first Saturday of the month from 9:00 am to 12:00 pm. If you have any questions, feel free to call 715-561-4450 or email joewal@centurytel.net. The address is 72 Michigan Avenue, Montreal WI 54550. United Way’s 2-1-1 is an easy to remember, completely confidential phone number that connects people with important information about food, housing, employment, childcare, transportation, health services, senior services and more! The purpose of the Special Supplemental Nutrition Program for Women, Infants and Children (WIC) is to promote and maintain the health and well being of nutritionally at-risk pregnant, breastfeeding and postpartum women, infants and children. WIC provides supplemental nutritious foods, nutrition and breastfeeding information, and referral to other health and nutrition services. WIC promotes and supports breastfeeding. Office hours: WIC Clinics are held in for Iron County residents on the 2nd Wednesday of every month at the Iron County Health Department.